Be the first to share your favorite memory, photo or story of Shizue. This memorial page is dedicated for family, friends and future generations to celebrate the life of their loved one. 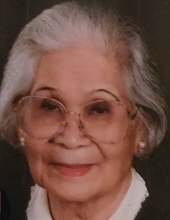 Shizue Higa “Sue” Moore, 86, passed away early Thursday morning at her home. Sue was born in Japan on April 16, 1932 and was the daughter of the late Takashi and Oshiro Higa. She was a member of Trinity Missionary Baptist Church. Sue was the kindest and most loving wife, mother and grandmother and a great friend to everyone. She will be missed by all who were blessed enough to know her. The family will receive friends on Sunday, March 24, 2019 from 1:00 – 2:00 p.m. at Seymour Funeral Home followed by a service to celebrate Sue’s life at 2:00 p.m. in the chapel with Rev. Brad Mitchell officiating. Interment will be in Wayne Memorial Park. Sue is survived by her husband of 61 years, George Boyd Moore; children, George Boyd Moore, Jr. and wife Melody, Barbara Moore, Raymond Moore and wife Amanda, and James Moore and wife Kimberly; three grandchildren and three great-grandchildren. In lieu of flowers, the family suggests memorials be given in Sue’s memory to Trinity Missionary Baptist Church, 1086 NC Hwy. 111, Goldsboro, NC 27534. To send flowers or a remembrance gift to the family of Shizue Higa Moore, please visit our Tribute Store. "Email Address" would like to share the life celebration of Shizue Higa Moore. Click on the "link" to go to share a favorite memory or leave a condolence message for the family.